2. Hit up a bookstore and explore. Jack and I love to shop at our local Barnes and Noble on rainy or cold, winter days. We both select books to browse and read, while we sip toasty drinks in the cafe. I love when Jack asks me if I want to go on a book date, because I know it means he’s itching to visit the bookstore. Of course, I let him purchase a book (or two) for his home collection. 3. Pay attention to the books your child loves. Jack is a huge fan of Pete the Cat and Fly Guy books. Both titles are apart of growing series. He loves collecting the books and keeping them safe and neat on his bookshelf, which I totally encourage. In fact, we just received Pete the Cat Saves Christmas in the mail. On this same note, I’ve picked up books with baseball and pet themes, because I know how much my kid loves the sport and his puppy, Lucy. And of course we tons of Lego books! 4. Remember it’s not just about books (OK it is, but trick them!). Colleen Coombes, 35, a pre-K teacher in Portland, Oregon, says it’s important to use many variables when teaching, encouraging and exploring early literacy. “Puppets, songs and trips to the school’s library entice my students.” Check out these printable song books you can you use in your home! Plus, Kaplan has adorable book and puppet sets your kids will love to interact with! Don’t forget about pop-up books and ones that come with bonus stickers and posters. “Anything extra is huge for kids!” cheers Coombes. 6. Look out for theatrical performances based on popular books. Last year a state university in our area put on a performance of Alexander and the terrible, horrible, no good, very bad day. To gear up for the show we borrowed the book from the library and read it together. Jack loved watching the words come alive on stage! And of course I took him to the movie theater to see the film adaption starring Steve Carell and Jenn Garner. The same university recently put on Henry and Mudge! Back to the library we went to borrow a book from the series and brush up on the story of a boy and his dog. And remember to see what the local high school is putting on. I took Jack to Beauty and the Beast at Wayne Hills high school and he loved it! 7. Download fun reading apps. If you think Angry Birds is the only game to entertain your child on a long car ride—think again. I have 3 awesome reading apps on my phone that Jack loves. Tales2Go gives him unlimited access to more than 1,000 stories and you can easily sort by reader age, genre, and more. 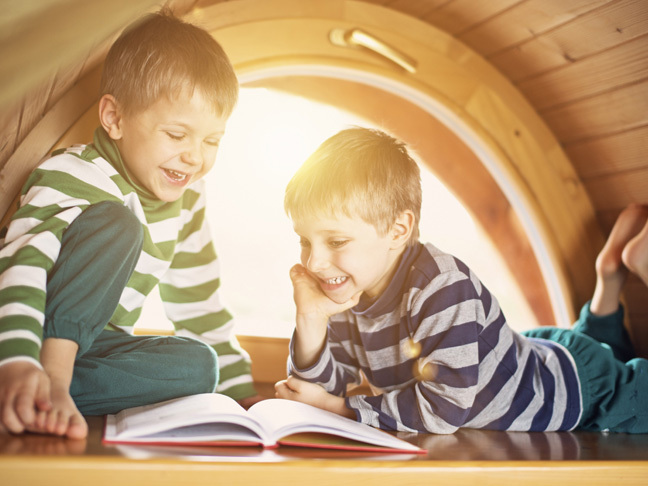 Bookster is so cook because popular books are narrated by kids—yes kids around the same age as your child. My son is a big of MeeGenius because you can personalize a book by substituting Jack for a character in the story.